"Avian Arabesques" is a show piece in three movements that explores a wide-range of harp techniques and embraces a number of stylistic and harmonic idioms. 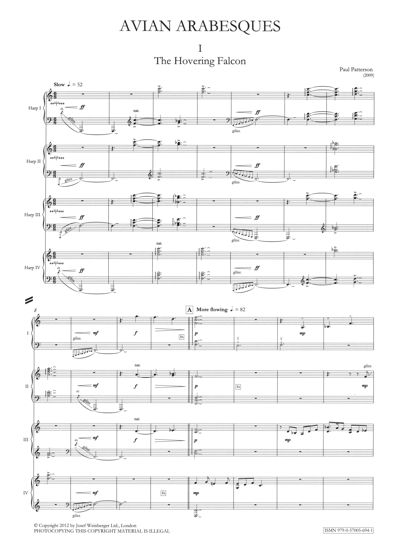 It was commissioned by the Royal Academy of Music Harp Department and premiered in October 2009. "Avian Arabesques" is a show piece in three movements that explores a wide-range of harp techniques and embraces a number of stylistic and harmonic idioms. It is inspired by mythically beautiful and exotic creatures that have fuelled legends of the Orient. As the title suggests the movements are named after three exotic birds. 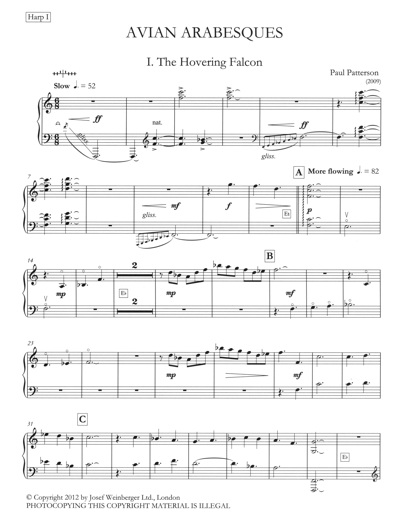 The opening movement, “The Hovering Falcon”, starts and ends with a series of dramatic cross-motion glissandi representing the dynamic soaring and diving of the Falcon on its prey. The central core of the movement takes the form of an inverted passacaglia in 6/8 time that gently flows between the harps giving it the sense of a relentless passage but with static motion. The second movement “Legend of the Anka” has a strong oriental ambience as the harmony used is based on an Arabian mode. The mode is heard in a melody at the start, played as harmonics, followed by sweeping glissandi, giving the atmosphere of the Orient. Long melodic lines weave their way through a labyrinth of modal arpeggios, showing the huge anka's alluring, graceful and powerful presence. Legend says the anka was an Arabian bird of huge size, large enough to carry an elephant. The finale, “Flight of the Phoenix” is a fast moving extravaganza that represents flight of the firebird where motifs and cross rhythms are passed furiously between the players who engage in hectic conversations with sharp harmonic twists including rising and falling chromatic scales. After a number of varying sections the work ends as the phoenix finally terminates its long flight and descends to settles back on land. 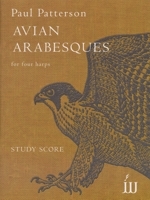 "Avian Arabesques" was commissioned by the Royal Academy of Music Harp Department and was premiered in October 2009.